In the year leading up to the fortieth anniversary of the fall of Phnom Penh to the Khmer Rouge on 17 April 1975 we are publishing extracts from the newsletters produced by Cambodia for Christ. This is the final newsletter in our possession, and it is probably the last to be issued before the fall of Phnom Penh. As news comes through about the continuing ravaging of Cambodia, we need to set our hope on God, recognising that He reigns all-powerful over the nations of this world. No one knows how the suffering of the Khmer people will end, but we know that God has a plan for His people there. They have been through many trials over the past years and now the threat of renewed persecution and suffering looms near again. We encourage you to keep on praying, all is not lost, God has been at work in a wonderful way during these war years, and the Khmer believers continue to have many opportunities to share their faith and hope in the living Lord Jesus. Only a handful of medical missionaries remain in Phnom Penh, please remember them, praying for strength of body and mind, for opportunities to witness, and for adequate supplies of medicine and food to be available for them to continue their work. I and the four other … missionaries who have been working in Phnom Penh, the capital of the Khmer Republic, were evacuated this week from Phnom Penh to Bangkok by the United States Embassy, so that means that AB and REC from the United States, AC, A and A from England, and DC from Canada, have all been evacuated, along with 15 missionaries of the … and three small children. Last week the head of the … was here in Bangkok, and, in consultation with Embassy officials, he deemed it necessary to send a strongly worded telegram to the … missionaries in Phnom Penh, telling them to evacuate within five days without any options. You can imagine that this was a big job, to say goodbye, to make over powers of attorney for mission vehicles and properties to the Khmer Evangelical Church, but this has been done and all the missionaries have come out, though there are many other expatriate people still living in Phnom Penh. The decision was an easy one to make because it had been made by somebody outside the country. There was no decision for us to make, but it has been a very difficult decision to take to leave the Church behind, leave behind those that we remember, their names, their faces, their voices. We do want to thank many of you that you have been praying for the Khmer Republic and its people at this time and I would ask you to continue to pray for them even though the missionaries have come out. Our plans are to rest for a few days then to meet together in conference and then, if the situation looks promising, we shall continue to do language study in Bangkok, or somewhere outside the country, until we can return. Nobody really knows what the future is but we do look to God to do a miracle to save this country, but we wait to see what God will do, so please continue to pray. What is the situation like? All the roads into Phnom Penh have been blocked for some time, and earlier this year the river became impassable because many of the banks were in the hands of those opposed to the Government. The river had been mined and some vessels had been sunk, so that, at the moment, it is impossible for ships to bring supplies up the river. The price of rice has continued to rise and is now four times the price it was when I first went into the Khmer Republic eleven months ago. There is a fuel shortage, electricity been reduced to a few hours every other day. There are many new refugees, there is malnutrition, particularly amongst the children in the refugee areas. There has arisen an anti-Chinese feeling and in Battambang, which I visited last August, near the Thai border in the northeast, some Khmer went into the Chinese stores and brought out their possessions and burnt them including money. They said it was tainted. We do need to pray particularly for the Chinese Christians that they will be protected. The Khmer killed many Vietnamese in 1970 and we do not want to see this sort of thing happening again. Finally, the following letter was written by Major Chhirc Taing and given to us as we left on the aeroplane during the evacuation this week. 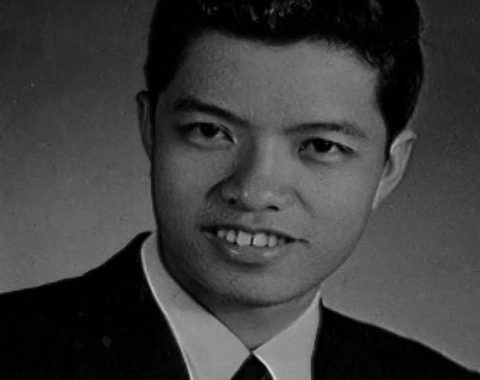 He is a young Cambodian who came to study in Britain, but when he arrived in Britain he read. these words: “He that saveth his life shall lose it, but he that loseth his life for My sake shall save it.” This was a verse which so spoke to him that he knew that he must return to his own country. It was through him that Cambodia for Christ was formed, which has helped many of us to see the situation in that country. “Where is the Lord God of Elijah?” he, Elisha, cried out, and the waters parted and Elisha went across. 2 Kings 2: 14 (Living Bible). This verse tells how hard it was for the young man Elisha to be left behind, while the old and powerful prophet of the Lord, Elijah, is taken away. Where is the Lord God of Elijah? This is also the cry of the young Khmer Church leaders at the moment. Elijah had been sent by God to the Israeli nation during the dark reign of its evil King Ahab. Despite the mighty miracles Elijah had performed the people had not changed their heart from sins when the time came for Elljah to be taken to heaven and the young Elisha had to carry on the mission during the dark days in Israel, but Elisha’s special request of God’s power was granted. The spirit of Elijah arrests upon Elisha, and they went to meet him and greeted him respectfully, v 15. Dear Friends, do remember us in your prayers as we Khmer Christians are left behind to continue the task in the difficult days ahead. We do need God’s greater power and wisdom as Elisha did. Please pray for us and ask God to give us the right words as we boldly tell our agonising people about the Lord, and as we explain to them that this salvation is for them now. May God add many more souls to His young Church in the Khmer Republic and let it grow stronger until the day of His return. The prayer letters ‘Cambodia for Christ’ have been a blessing to many Christians in many countries since they have started praying and interceding for us. We are grateful to them. Kindly send our grateful thoughts to dear friends who have been praying for us in these days of troubles and suffering. The Church here is very active giving God’s message through the official radio stations asking people to fast and pray. The response has been good. Our land has become a desolate wasteland. Our streets and our homes lie in silent darkness each night from 7 pm. At daytime there is fear of danger. Rockets fall right at the city centre killing people and destroying shops and houses almost every day. Many people have deserted us. We appreciate your prayer and intercession for us in these days of troubles and suffering in Phnom Penh. As noted in the introduction to this series, a month after writing this letter Taing Chhirc was beaten to death by Khmer Rouge soldiers. His widow and daughter were still in Edinburgh, Scotland. Sine January 1st the Khmer capital of Phnom Penh has felt the brunt of the New Year offensive by anti-government forces. Daily rocket attacks, artillery shelling and mortar fire have pounded the city and many have been killed or injured. “Almost constant booms and rumblings fill the air,” writes a missionary. “We have heard of many new refugees fleeing to the city, including Cham people, and others who didn’t make it.” The international airport has been hit by rockets, and barges bringing supplies up the Mekong river have sometimes been attacked and sunk. Necessities such as rice and fuel have been affected as supply routes are attacked resulting in shortages in the city. Pray for the Khmer people. Especially remember our brethren in Christ. Pray also for the missionary personnel. How hard it is to really understand what it must be like to be surrounded, continually wondering where the next shell will fall. May God’s people know His peace and the assurance of His Word that “their times are in His hands”. He will not fail them. Agreement has been reached between one remaining Vietnamese Christian family still in Phnom Penh and the Khmer congregation using the Vietnamese Church to convert the ground floor of the former parsonage into a well stocked Christian bookstore. There are now twenty-eight Sunday Schools in the capital. Last month classes for teens began. Scripture Press teen lessons are being translated to meet the need. A Bible Class in English sponsored by the Chinese Church in Phnom Penh attracted over a hundred students and business people. Several have professed salvation as a result of the classes. Daniel Lam, from Hong Kong, is the Church’s pastor. The first Christian hospital (a joint project of World Vision and the C. & M.A.) should be ready for patients in April. Pray for this testimony to the love of Christ. During the latter part of 1974 a number of Khmer in the vicinity of Cantho in South Vietnam prayed to receive Christ. Some of them were contacted during a leadership training session in which participants spent two and a half afternoons in personal witness. With provincial dignitaries and Khmer speaking Christians from other parts of the province in attendance, the first church among the Khmer in Thailand was dedicated at Surin. Four other groups of Khmer-speaking believers hope to build churches in the near future. After a day and a night of bitter debate the UN General Assembly defeated by two votes a move to expel Marshall Lon Nol’s government from the UN. For more than two years the Algerians and China have led a non-aligned block battle to oust Lon Nol and give Cambodia’s seat to the Peking based regime of Prince Sihanouk. Their basic argument was that Sihanouk had been overthrown by ‘foreign invaders’ (e.g. Americans), that he was still in authority and that the Khmer Republic would collapse if United States aid were withdrawn. Cambodia’s Asian and Pacific neighbours and the Western nations submitted a counter resolution which instead of supporting either faction simply called on both to hold peace talks, this motion was passed by a narrow two vote margin, the second time this has happened in two years. The situation is reported to be bad and the start of the dry season has brought an increase in enemy activity. The end of the war or some sort of agreement would seem to be the only hope for a country struggling to survive. Please pray for a speedy settlement to war and for continued freedom of worship, and praise the Lord for preserving Cambodia as a nation. Last month Dr Penelope Key, a Christian Doctor with World Vision on a short furlough to England, brought news of the Child Care programme operating in the Khmer Republic. There is a large World Vision medical team in the country: 105 Khmer workers including four doctors, seventeen trained nurses and a large number of auxiliary nurses. A few staff from overseas are also there. World Vision along with the C&MA run the only four nutrition rehabilitation centres in Cambodia. One centre is open 24 hours a day for emergency cases. Children are admitted with kwashiorkor and other severe forms of malnutrition and they usually stay for about four weeks, long enough to get on their feet again. About 80 children are catered for there. Three day-care centres also exist for less severe cases. Dr Key holds child-welfare clinics, as possibly 98 percent of children in Cambodia are malnourished. Most families exist on just rice (when it is available and supplies get through); very little fresh fruit and vegetables are to be seen and the average family eat meat once a fortnight. The rice (which is imported) is the highly milled sort, lacking in vitamin B; therefore most of the population suffer from vitamin deficiency. The overall condition of children is deteriorating and many are open to infection. There is a high mortality rate through measles; one in twenty who contract it die. Typhoid, polio, dysentry, pneumonia and tuberculosis are on the increase. Medical teams have gone out to large provincial refugee areas and report that these are in a very poor condition. Recently an influx of refugees came from a town seventy miles north of the capital. They had been living in trenches for three months and finally 20,000 were ferried out by river. They were later visited by a medical team and the Asian Christian Service. Boeung Trabek is a new church group started recently when a layman opened his home for services. Already about 70 people come each Sunday. North Dyke is another new group in a refugee area. In Bethany church, Christians are meeting from 6-7 am daily for prayer. Takhmau Bible School has its highest enrolment of 25 students. Theological Education by Extension classes are held two evenings weekly. About 103 have enrolled. The Operation Mobilisation team from the ship Logos came in September for one week of discipleship training and teaching. Over 100 young people attended. Bible studies in English and French have been started in two private schools. Over twenty other English Bible studies are held weekly in the Youth Centre, in churches and homes. About ten Buddhist monks attend one class. Christmas programmes have already begun in Phnom Penh and will continue to be held in the various churches until the end of December. After four years of guerrilla warfare the Khmer have learned to carry on regardless of restrictions, shortages and many basic necessities being unobtainable. The inevitable inconveniences are accepted, life must go on. There has been an increase in political activity recently, and news reports of renewed bombing, but few details to include in this letter. Marshal Lon Nol, President of the Khmer Republic, made a public call for peace on 9th July. No prior conditions before talking together were asked from the Khmer Rouge, the North Vietnamese and the Vietcong from South Vietnam. Mr. Dean, the USA Ambassador in Phnom Penh, is working for a peaceful solution to the war. The war has had its effects on schooling, as many French teachers and lecturers left the country when bombing increased earlier this year. The building programme has had to be curtailed due to supplies being needed for other projects and a slowing down of materials reaching the capital due to hazards along the Mekong River. The Lord continues to bless Church growth. One missionary writes that church groups are beginning in many homes, the pattern in Acts is being reproduced, with spontaneous growth of fellowships primarily in the homes of new Christians. These new believers radiate their love for Christ. Our prayers are requested for the establishing of a Church at Battambang after the meetings held by Ravi Zacharias in July. Many attended but few have carried on who professed faith in Christ. On this same theme we as the body of Christ are urged to pray much for the young converts in this land, that they may be kept during a period of confusion for them with numerous groups now coming to Cambodia. With so many Christians being untrained babes in Christ, it is difficult for them to determine who is genuine and who is not. Training sessions are being held and Bible classes taught but it is difficult to properly instruct all of those who come to Christ before they are contacted by other groups. Please remember Major Chhirc Taing in Phnom Penh. He has many responsibilities in the Church: Executive Secretary, advisor to other projects, also head of the World Vision child-care programme. His duties as Secretary to the Minister of Defence are also very demanding. Pray that he may soon be reunited with his wife and daughter who are in Edinburgh. Thank you for continued prayer for the Khmer people and those who work among them. May peace soon come, and the harvest be brought in while the open-door and opportunity exists. This month in Cambodia the monsoon rains began to fall, bringing to a halt until October most of the military activity – perhaps a time of peace for a while. Life goes on as normal for the Khmer people accustomed now to the signs of war in their midst: soldiers, refugees, curfews and power cuts. The past three years have seen progress and some setbacks for the government of Cambodia in the defence of their country. Though the communists are strong in the rural areas and have conscripted many Cambodians for their “liberation” army, they have had few major successes, and their two campaigns to take the capital of Phnom Penh have failed after many predictions that it would fall. In three years the Khmer Rouge have only succeeded in taking one provincial capital, the small but historically significant town of Oudong, once the Royal Capital, a town of about 50,000 people lying about 24 miles north-west of Phnom Penh. Oudong fell in March this year. The bombing of Phnom Penh’s suburbs which caused panic and confusion and led to the exodus of many foreigners stopped after a month due to heavy shelling of the communist position by government forces. The Khmer army is beginning to regain confidence and it seems as if the present situation could continue indefinitely, with neither side able to gain complete victory. Missionaries in Phnom Penh report that although the war has had its effect, military-wise it is calmer than expected and rocket scars are not as evident as the news media would lead one to think. The airport was 90% destroyed in 1970, but today you would not detect that it had been hit. Malnutrition amongst refugees is one of the biggest problems and although many relief agencies are at work, refugees do not have the money to buy proper food and the children especially are suffering. All Cambodians are aware of the serious political and economic situation. Khmer Christians are praying, that there may be many more years of opportunity to share their faith with their own people. One young Cambodian when asked if he was prepared to stand for his faith in the event of a hostile takeover said he was, and that he fully expected to be behind bars one day because of his love for Jesus Christ. It is commonly felt among Christians in Cambodia that a regime hostile to Christianity could put the Cambodian Church back into the shadows once again. Christians need to remember this tiny land of seven million people and its small, but growing Church. In letters from Khmer Christians they always plead that we urge the Body of Christ everywhere to pray for Cambodia and the Christian witness there. Will you pray? We do not have a copy of Newsletter 5, so the next extracts to be published will be from Newsletter 6, first issued in October 1974.